Nasal congestion is commonly thought of as the result of too much mucus in the sinus cavity, but it is mostly caused by inflammation in the nasal tissue. Your nasal passages are made of soft tissues lined with mucus membranes that help filter the air before it enters the lungs. If you're allergic to gluten, a protein found in various foods and grains, you may develop nasal congestion within a few minutes of eating foods that contain gluten. Although increased mucus can cause sinus congestion, inflammation and swelling in the sinus tissue can cause obstruction in your nasal passages. This blockage will restrict your ability to breathe through your nostrils and drain mucus properly. Nasal congestion commonly causes pain and tenderness in your face, teeth, behind your cheek bones and in your forehead. A stuffy nose can cause pressure to build up throughout the head and a condition called postnasal drip, in which mucus drips down the back of your throat. Most sinus pressure is the worst in the morning and typically gets better throughout the day. 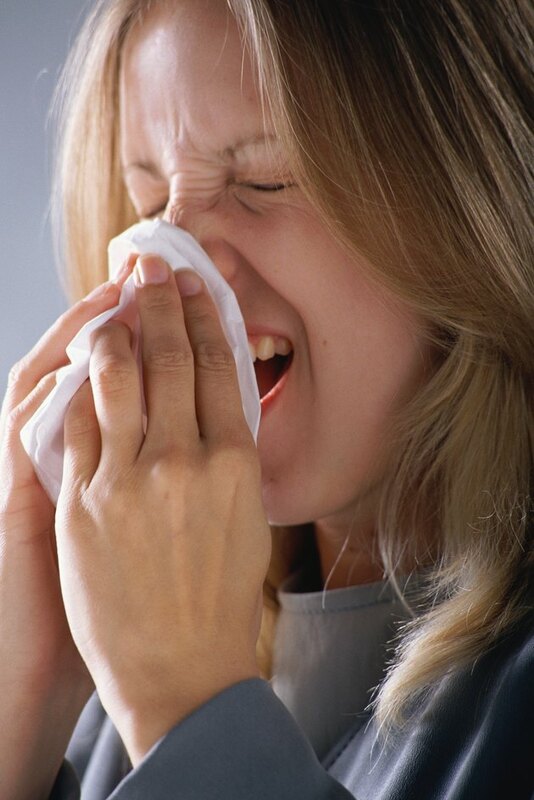 Nasal congestion is a common symptom of a food allergy. Gluten may trigger an exaggerated immune system response that causes the production of histamine in the sinus cavity. When gluten enters the body, the immune system mistakes the protein for an intruding substance. It reacts to gluten the same way it would to an infectious organism, such as a bacteria or a virus. Antibodies are created to attack the gluten, which trigger white blood cells to produce histamine. Histamine helps protect the body from infection, but in high quantities it causes swelling, irritation and inflammation. The most effective way to prevent a nasal congestion from eating gluten is to avoid all foods that contain the protein. Food allergies are incurable and may last a lifetime. The most common grains that contain gluten include oats, wheat, rye and barely. Gluten may also be found in lunch meats, salad dressing, breads, crackers, cookies, pasta and any other foods that contain these grains. If you have a gluten allergy, you will need to purchase foods that are naturally gluten-free, such as fresh meat, fresh fruit and vegetables and dairy, and foods that are certified gluten-free. Treating sinus congestion may include the use of over-the-counter decongestants, saline nasal sprays and antihistamines. Talk with your doctor before you use any medical or natural treatment for sinus congestion.